STRAIN 2005 COLLECTABLE ORNAMENT – "ONWARD CHRISTIAN SOLDIERS"
Here for your consideration is a signed and numbered limited edition 2005 Collectable Christmas Ornament featuring John Paul Strain’s amazing print "ONWARD CHRISTIAN SOLDIERS." After Sunday afternoon services the leaders of the Army of Northern Virginia headed back through the snow draped countryside in a joyous mood. General Stuart’s close friend and horse-drawn artillery commander, Major John Pelham of Alabama, often accompanied the leaders. The idol of many southern belles, the gallant and dashing 24 year-old Pelham had proved his bravery at Fredericksburg and would fight in more than 60 engagements. His daring skill and ability to keep up with his commander’s fast moving cavalry raids refined the concept of flying artillery. Leaders such as Lee, Jackson, and Stuart would call on many such men to sacrifice and give all for their country. It was also their hope and prayer that if the day came when they did not return to camp with their companions, the Lord would embrace them and say, “Well done my brave Christian Soldier." 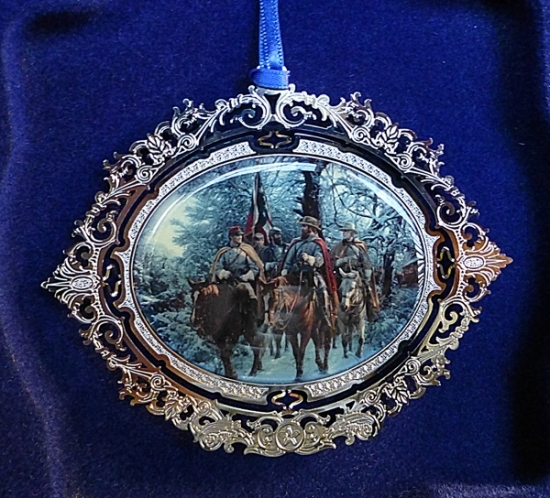 John Paul Strain’s print "ONWARD CHRISTIAN SOLDIERS" featured on the 2005 Christmas ornament depicts Major John Pelham with Generals J.E.B. Stuart, Thomas "Stonewall" Jackson, and Robert E. Lee near Fredericksburg, Virginia in the winter of 1863. This gorgeous ornament is individually signed and numbered by the artist, is packaged in a silver foil box embossed with the year and the artist’s name, and comes with a descriptive Certificate of Authenticity.